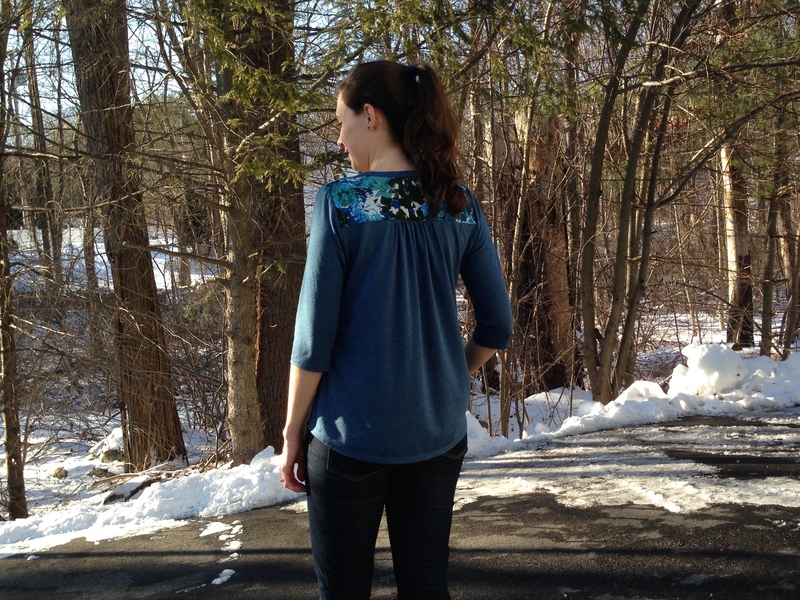 Your blouse looks great and I love the contrasting fabrics! Love it! Camas is in my to-sew pile. I think it would work great for the office. Can’t wait to see yours! It would definitely be a great office-wear blouse. Wow, that’s beautiful! The knit must drape so beautifully off the woven, what a wonderful idea! It really does! Initially I was worried about using a woven, but given that it’s a good idea to have something stable for the yoke, it worked out great. Thank you! This is great. I love the fabrics you’ve chosen. Thank you for your hard work. From the photo, even with your adjustments,it seems that the front styling will show your entire bust when you lean over. Are you finding that to be true? I have a problem with patterns that look fine when I am standing straight and tall but less attractive when I am moving around. I generally avoid bending over when wearing a low cut V-neck, but yes I imagine there would be a bit of flashing! It would look nice layered with a lace edged camisole or, if you’re feeling up to it, you could raise the neckline by quite a bit. This looks really cute and comfortable! I wasn’t sold on this pattern when it initially came out, but it’s great to see how it looks on a variety of different people. I love your version, especially with the floral contrast. 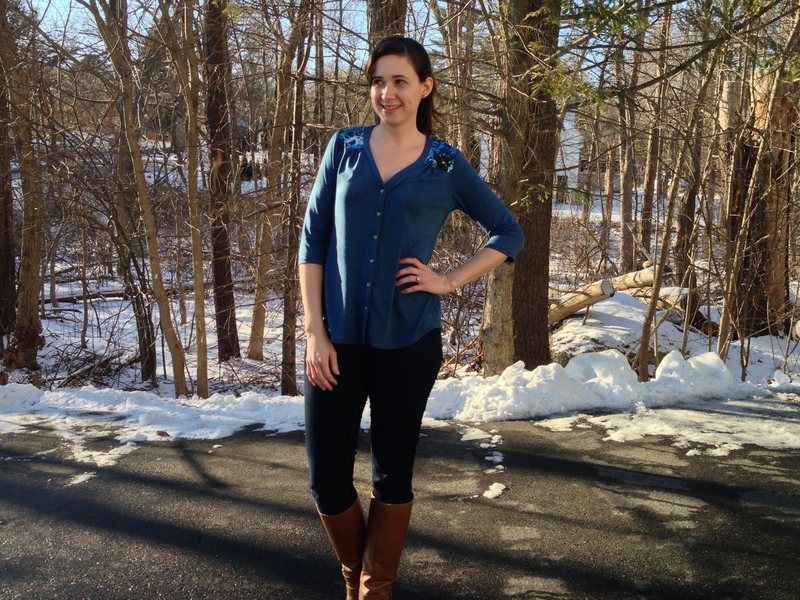 I agree with Katie – it’s perfect for office wear. Pretty! It looks nice and comfy, too. LOVE this pattern, and your version is great! May have to try it out sometime! Adorable! This pattern is quickly jumping to the top of my sewing list. Would look so pretty with lace on the yokes too! Wow this fits you perfectly. Love that contrast woven! This looks fantastic on you Lisa!! I love that colour! I was wondering how it would work with a woven yoke. 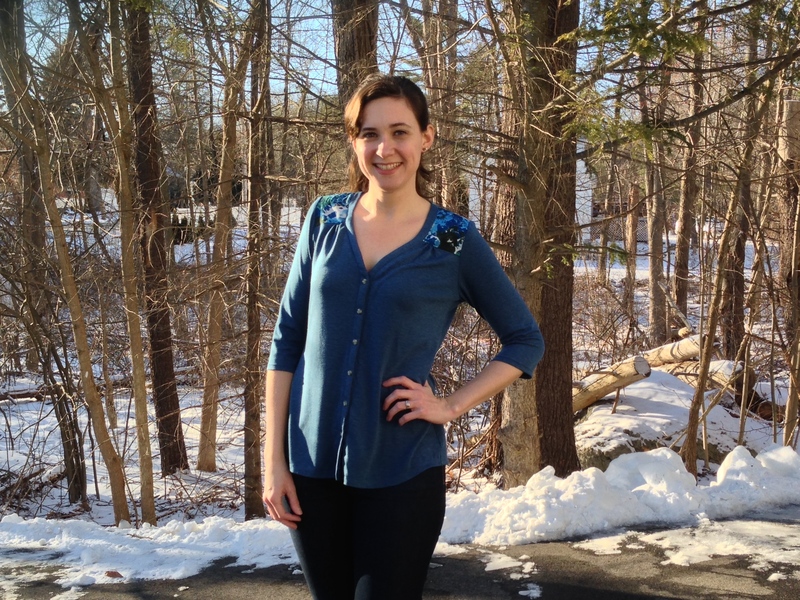 This blouse is in my queue of things to make so I am happy to read your review. This is such a great top. I love the yokes and the scope this gives to spice up a lovely staple. Love it. I bought it when it was on sale the other day. Can’t wait to make it up. It’s all the things I love in a top. Something about knit blouses seem incredibly difficult to me; yours looks very effortless and beautifully sewn! Lovely, the fabric colours really work well. 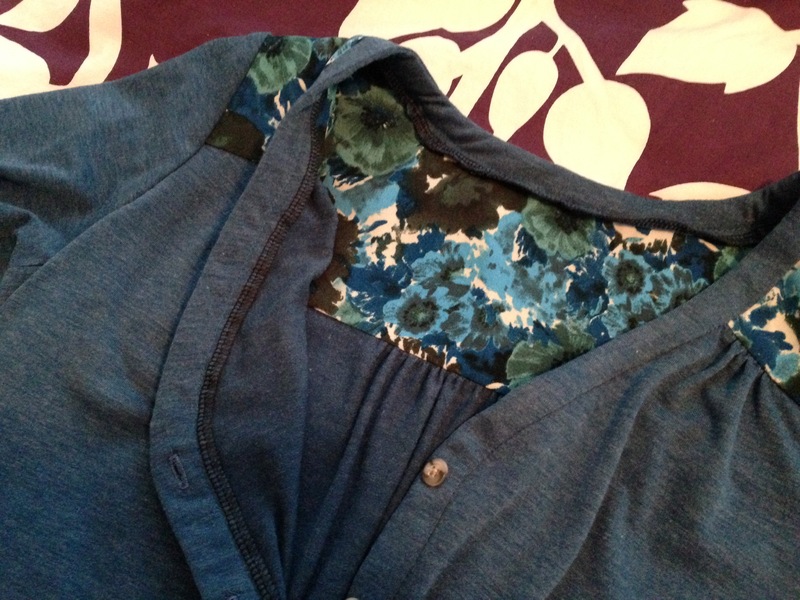 I was also thinking of the neckline possibly being too low, so it’s good to see you’ve done it & it looks good. I really want to get going on mine now! This top is so you. I just love it! Very nice! It really looks like a dressy Tee! It turned out so nice! I’m glad the fabric weight was perfect for this project. It looks great! This is such a cute blouse! 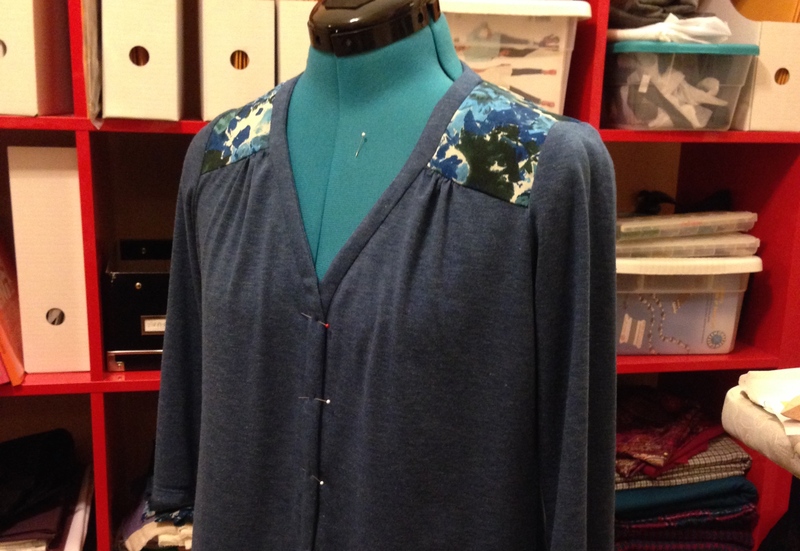 I love the patterned yoke! Lovely!! I got started on this but then Christmas & work took over. Really must make it up – looks lovely & confortable, a winning combination! I am not familiar with the pattern but it is so cute on you and is definitely going on my list! I should have known you make this as soon as possible – I already bought the pattern and am now trying to find appropriate matching fabrics… But now I want to make it more than ever! Thanks for your insights on sizing, interfacing, and the SA problem! I really like this pattern as an upgrade from a “basic tee”. A nice wool jersey office wear or a cotton jersey relaxing at home. Morgan is doing a fantastic job with her classics. You did (as usual) an inspiring job. I really love a v-neck with a lace trimmed camisole underneath. Casual, comfortable with a little luxury !!! This looks so neat! 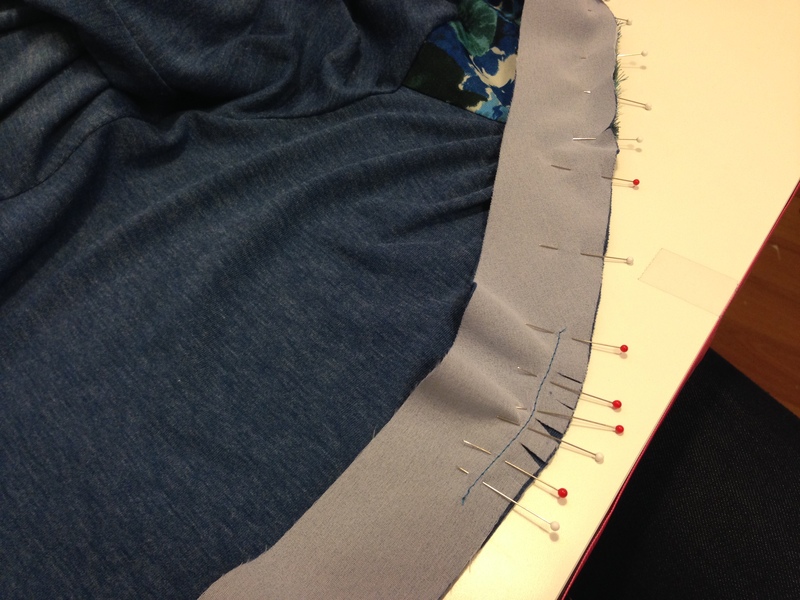 I’m very impressed with how nice your button placket is! Fab!